Sales numbers are something I don't share often. I don't feel like they need to be shared. I don't casually throw them out there like some well-known self publishers. For one, my numbers aren't that impressive. Two, I hope that if you are here at the blog you've read one of my books and are wanting to know more about me. Or you've been here before and enjoyed what you read. That brought you back. Today's different though. I'm sharing some rough sales numbers to ask the question of "When are you a success?" But let's say that your goals are bigger than that but smaller than become an New York Times best seller. If that's you, then when are you a success? Is it measured with a certain number of sales overall? Is it measured with a certain number of sales per month? Is it measured by a certain amount of money made per month? Is it when you can quit a day job and work full-time as an author? I suppose that last one makes the most sense, but what if you are married to someone who does very well financially and that person's salary allows you to devote your time to writing. That's great for you, but it doesn't mean that you're making enough to support yourself. If we do measure success by number of overall sales, what number do you go with? Is it 1,000? Is it 2,000? That's roughly where I am right now if you count my free book downloads. Am I a success? Or is success not at all measured by sales, but consistency. Is someone who writes multiple books and continues to produce content even though their sales aren't great a success? What about someone who produces just one book, but it sells like gangbusters? I'd love to know what you think. Tell me, when do you think an author is a success? Here's episode two of the serial story, Mai. If you want to catch up, the first episode is here. Got a few comments on teh first episode. Would love to hear what you all think of this one too. Mai watched his nephew walk away, behind the two men in flannel and carrying the crate of guns. The boy was a hulk. He stood a foot taller than either of the men who’d just bought him. The crate, weighing a few hundred pounds loaded like it was, provided him no challenge. Yun walked away from Mai, across a field and toward the beach where the men’s ship was waiting. It was a large hulled ship with an open cargo door on the side. Big engines hung off short wings that came out from the side and near the back. The first man, the one who’d been on the left earlier, stepped into the ship first. He took the crate from Jun when the young man approached and promptly dropped it. It hit the ground with a thud and rattle that Mai could hear even though they were a few hundred yards away. Yun stood outside the ship and watched the two men shove the crate deep into the cargo hold. He hesitated before stepping into the ship himself. Mai heard a faint hiss and the cargo door began to lower. Mai craned his neck and watched until Yun disappeared into the dark behind the closing door. The engines whined to life then roared. The ship lifted straight up, inched forward and made a graceful turn then blasted over Mai’s head. He watched it disappear into the distance then turned to head up the hill. It didn’t seem that long ago to Mai that he was walking up the hill carrying a much younger Yun, wrapped in an infant’s robe, his bald head slicked with rain, and sucking on the tip of his uncle’s index finger. “I don’t know anything about kids,” Mai had told his sister when she put Yun into Mai’s arms. “You know you can’t visit, Qan. Not if you want him to be kept safe.” Mai looked down at his sleeping nephew. He squirmed in Mai’s arms then settled with his chin tucked into his chest. What's a classic book you just can't finish? It's Wednesday. That means it's question time. This time it's about classic books that you just can't finish. I have one, and I may have mentioned it here before. Catch 22. I just can't get past the circular logic. I know that the circular logic is the point of the book and how none of it's supposed to make sense, but it drives me crazy. I can't get past it. I've tried a couple of times, and I always make it about halfway through the book then get so frustrated I have to put it down. I really want to finish it, but I can't. There are other classics that I've read that I didn't think were all that good. But at least I got through those. Catch 22 just stops me dead every time. Your turn to share. What is a book that's considered a classic that you just can't seem to get through? It may be the writing. It may be the characters. Whatever it is, you just can't push to the end. First, a confession. This won't have pictures. At some point I may take part in the "Where I Write" meme and take pictures of the places I create, but not today. I've spent the last week doing stuff around the house to get ready for baby (Her room is finally painted.). So I never had a chance to take pictures of the places I write. Plus, the house is a wreck with all the stuff we've got going on. Gina would kill me if I took pictures of the place and posted them for the world to see. So instead of going literal with 'Where,' we'll take a quick look at "Where do I see my writing in 5 years?" I'm betting all my chips on the long tail. It's the theory that you are better off selling a lot of things to a small number of people than you are selling a lot of one thing to a large number of people. Put another way, you're better off building a small fan base who will buy everything you put out than you are trying to make your one offering a blockbuster that everyone will buy. That theory makes a lot of sense to me, so that's what I'm going to try and do. I'm going to spend the next five years working to build a fan base. Work to get my name out. Continue writing and continue publishing. And hopefully by 2017 I can look back and see that my efforts worked. I'm not a blockbuster writing author with a book in every household, but I've got a nice number of fans who like what I do. They support me by visiting the blog, sending me messages on Twitter (or whatever social media services are around then), and buying my books. Notice that there aren't any specific sales numbers mentioned? One thing I've learned in the 14 months I've been doing this is that you can't control that. You lead a horse to your book, but you can't make them buy. Or something like that. Did I miss my promotion window with Chasing Filthy Lucre? I was mowing the yard the other night and was doing a little thinking. For some reason I do some of my best thinking – at least on writing and book stuff – while I’m pushing the mower. The other night I was listening to a podcast – also something I do while mowing – and for some reason my mind went to marketing Chasing Filthy Lucre. I got to wondering if I missed my window with it. Like any other author, I am always trying to figure out who my audience is and how to get my book in front of people who might like it. The book centers around a group of people fighting a corporate power. Would have been perfect for the Occupy crowd that seemed to be everywhere just a few months ago, right? Wouldn’t they have loved my book? Now, my politics are just about 180 degrees different from most people who were out protesting, but I think Chasing Filthy Lucre is a book that they could really get into. I know that the Occupy movement isn’t dead -- definitely not as active as it used to be -- so there’s still a chance. I just don’t know how to reach those potential readers. I’m open to suggestions on how to find them if you’re wanting to share. When was the last time a book surprised you? When I pick up a book, I try not to have expectations. Expectations are rarely met. You expect to love something, and it never measures up to what you expected. You start something thinking it'll be awful, and you can't put it down. There's a series of books I like. Never been disappointed in any of them. There's nothing particularly special about the series. The books are kind of formulaic. But the writing is good, and I like the lead character. A couple of years ago I picked up one of the books in the series that I hadn't read yet. I started reading it and about halfway through I had to put it down. It was awful. The plot was thin, and the main character spent chapter after chapter roaming around doing nothing. I could feel the writer trying to figure out what to do next. I was terribly disappointed. And I was surprised. This is someone who hadn't let me down before. I could rely on this guy to keep me entertained for a few hundred pages. That leads us to today's question. When was the last time a book surprised you? And this can be surprising in a good way or bad way. This one is easy. I’m a genre writer. 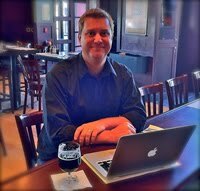 I write crime and sci-fi stories, mixing a little of each into just about everything I do. I write about the underdog. I write about the everyman who’s been put in a situation that’s not of his making. His back’s against the wall. He’s being forced to act, more than likely in a way he never thought he would. I am also a short writer, or I tend to be so far. Chasing Filthy Lucre is 21k words. Reunion is 8k. Scouts -- the follow-up to Reunion -- is about 13k. I like stories that move quickly. Shorter stories do that. One of the reasons that I really like the digital publishing movement is that it allows a writer like me to have a chance at some success. In the print world there’s not a place for someone like me. There isn’t money in publishing stories at that length. But doing this myself, I have no expectations. Any sale’s a positive. I can ride out those slow months. Not panic. Let my stories find an audience, because I think there is one. I think there is a definite group of people who want to read the kinds of stories I write. Digital publishing also gives me a chance to try different things, like something I’m calling Episodic Fiction. Yeah, I know that’s a fiction term already, but I’m co-opting the phrase for myself. Think of a serial TV series. Each episode tells another part of a larger story. That’s what I’m going to try to do. Each chapter in the series will be an episode. One entire story arc will be a season. Each season will be six to eight episodes long. Just something I want to try. I know that the concept isn’t really original, but I’m excited about it. I think there’s a market for something like this. Priced correctly, with compelling covers, and smart marketing people will buy these types of stories. Will I become a best seller? Who knows. But it won’t take me becoming a best seller to consider myself a success. Enough rambling. Next week we tackle “where,” and I don’t see how I can handle that one without some pictures. So, you have that to look forward to. Mai -- episode 1. A serial story. These started as writing warm-ups for me. Just something to get the juices flowing. Then I found that I was enjoying writing these more than just about anything else. The story was more interesting to me, probably because I didn’t know where it was going. Each day was an adventure. Discovering who these characters actually were was fun. And figuring out a spot to end each day’s section so it led into the next was a real challenge. These stories don’t have an overarching title yet, so I’m just going with one of the character’s names. I hope you enjoy it. Mai-Le sat cross-legged weaving strips of wet palm fronds into a basket, a fresh cut bleeding onto his lap. He was going over, under, over, under when he heard the first signs of them approaching. The roof of his hut shook as the aircraft passed over. Mai gathered himself and a few things and headed for the shore. Customers. Mai placed three automatic rifles on one large flat rock and placed two grenade launchers and a handful of small grenades on another. Two burly men with full beards and wearing tattered flannel approached with a wave and a smile. “Hello,” the man on the left shouted. Mai nodded his hello and readjusted the merchandise. “What do you like?” Mai asked when the men got closer. “Those,” the man on the left said, and pointed to the rifles. “And those,” the other man said, pointing at the grenade launchers. “How many do you like?” Mai asked. One of the men ran a hand through his tangled beard and scratched his chin. Yun came out of a second smaller hut that was set just behind the one Mai had been using earlier. “We need nine rifles and ten grenade launchers. Help me.” Yun entered the hut first and pulled the top off of a wooden crate. Inside were a dozen rifles. He began pulling them out, two in each hand. “We’ll use that crate so leave nine guns in there. And add these.” Mai handed grenade launchers to his nephew. Yun stood slumped in the low-roofed tent. He packed the box quickly. It was a sloppy job and his uncle kept sticking his hands inside, trying to adjust all the work Yun had done. “I can carry it myself,” Yun said and reached to both ends of the crate. The two men were near the rocks. They were watching Mai and Yun. Mai looked down the hill and waved to the two men. The man on the left waved back. Yun put the crate on the ground and Mai hurried around to one side. He looked at his nephew and the pair picked up the weapons and slowly walked them down the rocky path to the gentlemen. Moss had started to grow and the rocks were slick from days of rain that had only stopped that morning. Mai took cautious steps. Yun didn’t proceed as gingerly. The guns rattled in the crate with each step. Mai watched the men. The men watched Mai and Yun. The guns rattled. Mai and Yun reached the bottom of the hill and set the crate down at the feet of the two men in flannel. Mai lifted the top and smiled. He pointed to a dozen grenades he’d put in just before they brought the crate down the hill. Both of the men smiled and nodded their thanks. The man on the right reached into his back pocket and pulled out a neat stack of bills that had been folded in half. He licked a dirty thumb and peeled four bills off the top. He handed them to Mai. Mai smiled and put the bills in a pocket inside his robe. Yun was standing behind his uncle and stepped forward when the men reached to pick up the crate. Mai tried to stop Yun as he passed, but he couldn’t. Yun reached down and put a hand on either side of the crate and lifted it like it was empty. The two men who’d just bought the weapons looked at Yun and then each other. “Put it down, son,” said the man on the left. “There’s one more thing we need,” the man said and looked at his partner. The partner took the wad of bills out of his pocket and unfolded it again. He licked his thumb and began sliding bills off the top of the stack. “How much for the boy?” the man on the left asked. Yun just watched the conversation happen. The man on the right continued to pull bills off the stack. The bills in the pulled pile were starting to rival what was left in his original stack. He stopped and fanned the bills in his right hand out like cards. He laid them on the top of the crate. The man peeled more bills from his stack and laid them on the crate in a separate fan of cash. Mai paused then motioned for Yun. Yun approached and Mai began to walk up the hill to his hut. “Get your bags together,” Mai said to his nephew. Mai opened the flap that covered the entrance to his hut. He wiped a tear from his cheek and grabbed a pencil and scrap of paper from the trunk in the corner. He closed the lid and scribbled some numbers on the paper. He stepped back outside and waited for Yun. He heard the boy stuffing clothes into a bag. Keepsakes rattled on a desk that Yun had in his hut. A moment later Yun came out, a green fabric bag thrown over his shoulder. “Do you have everything?” Mai asked. Yun put out his right hand and Mai pushed the paper he’d scribbled on into his nephew’s palm. Yun opened the paper. How long is too long between books? I’m wrapping up the last bits of the first draft of the follow-up to Chasing Filthy Lucre. It’s been a long process, with stops and starts. I think I’ve written close to 40,000 words on one version that will never see the light of day. It’s good stuff, but not right for this book. I never intended to go this long between books. I have all three of the remaining books loosely plotted. It’s just finding time to write them all that’s hard. Anyway, I got to thinking about this the other day and wondered if I’d missed my window. Have I waited too long between books? Is any momentum I had built gone at this point? We are looking at a little more than a year between releases. So I turned the question over to the people who follow my author page on Facebook. They gave me some great answers, but I’d love to hear from all of you here, too. Here’s the question. Answer in the comments. I’ll respond. When reading a series, how quickly do you want the next book to come out? Assuming that immediately is not an answer, what's the right amount of time between installments? What if that series is not a serial, meaning that the next book doesn't continue the story started in the book before it, but features a recurring main character? So, who am I as a writer? I’m a genre writer, if we are keeping this simple. I’m an indie publisher. My writing is sparse, with no wasted words. I hope I’m entertaining. Reviews make me think I am. I’m a writer with big plans. Right now they are plans that are bigger than the free time I have. But I have some things kicking around in the back of my mind. And if I do them to the level I think they can be done, things could explode. Well, explode is the wrong word. They won’t explode. But it could go well. Let’s leave it at that. Well, I’m a lot of things. First and foremost, I’m a husband. And in a few weeks, I’m going to be a dad. I owe a lot of my writing success to my wife, Gina. She’s the one who pushed me to write and publish Chasing Filthy Lucre. She believed in me as a writer, almost before I did. Funny story. We were out with some friends just after Gina and I had met – literally a day after we’d met. This was the second time we’d seen each other. Well, third time. Anyway, Gina and I were talking and she asked what I did for fun. I told her that I was a writer. She seemed incredibly impressed. She had me from that moment on. But Gina pushed me. She encouraged me to write. She encouraged me to do more with the writing I’d already been doing. She’s also in every story I write in some way. They are all small. Only she and I -- and maybe some family members -- will recognize it. But she’s there. I’m also a Christian. I know that may not be a huge revelation. If you’ve read this blog for any amount of time or follow me on Twitter, you already know that. But it’s something that shapes who I am, not just as a writer, but as a man. My faith is hugely important to me, and I think that can come across in my writing. I’m not saying that everything I write is an allegory to the Gospel story. Actually, none of it is. But my faith is reflected in my writing in one pretty specific way (not counting that the title of Chasing Filthy Lucre comes from the New Testament book of Timothy, among other places). My writing has hope. I put my characters in some pretty dark places, but I like to think that in the middle of all the dark, there is a kernel of light that’s shining. That’s what my characters are running toward. They have a belief that things are going to get better, not matter how bad it seems at the moment. And that’s a big part of Christianity. At least it is for me. When I’m in my dark moments, I have faith that God is going to still be there. His light may be dim, but it’s there. If I can keep my focus on that light, I’ll get through the dark. Without giving too much away, give us the Evan Gabriel story. Tell us why we should commit to this three book series. The Gabriel trilogy is a science-fiction adventure story, set in the near-future, that follows the arc of a disgraced Navy Special Forces Commander as he travels the road to Redemption (to find his way back into the life he once knew), his Return (a mission to the site of his most haunting memories), and finally his Revenge (as the final straw in his rough life has been placed on his shoulders). As someone who is also working on a series of books, I have to know, what's it like to type that final "the end?" Is it more relief that you're done? Or is there some disappointment that it's over? I don't think it's either, relief or disappointment -- not even sure if it's sunken in yet. It's been an entire year living with the story and the characters, but knowing how the story would end from day one meant I was prepared for it. Writing the last scene was very exciting, wrapping it all up, all 220k+ words in three stories, but relief or disappointment I don't think characterizes the feeling. Maybe just exhaustion? Are you finished with Evan, or will we see him again? If not, is he going to be a character you can easily let go? I thought I was finished after the first book, only to find I wanted to (a) explore that universe more, and (b) go further into the characters and Gabriel's past, so I kept going. I knew, I swore, I was done after the trilogy was complete, but in the weeks following, as I thought more and more about it, there were several places within the arc that spoke of a deeper backstory for Gabriel. I also had several readers asking the same question - will we see him/them again? Which leads naturally into a further story, but this time a prequel. I've already got a few things sketched out in an outline, as have two chapters written, of a prequel showing how he became who he was at the beginning of book one. Is a series something you want to tackle again? Most definitely. It was a blast creating the universe the characters lived and acted within, so to create that for one story only seems like a waste. Also, the characters themselves didn't get developed enough in one book, which was actually my impetus for doing a second and third book (even though I knew how the story would end, I never planned on a trilogy, believe it or not). Well, drats - answered that to some extent above. In addition to the prequel, I've had a couple other non-Gabriel stories dancing around in my head (including one non-military scifi that was getting in the way of completing book three) that I will try to put to paper this year. My goal is to write and release three full-length novels in 2012, as well as maybe some novellas, perhaps tangents to the Gabriel universe (I've had several readers comment on some of the secondary characters as well). Breaking the rules. Is it OK? I recently finished reading Charlie Huston’s Caught Stealing. Great book. It’s a rollercoaster ride that takes off on Page 1 and doesn’t stop. It’s brutal and profane, but it’s a ton of fun. I loved the voice, and I loved the structure of the novel. It’s not written in long chapters, but shorter chunks. Sometimes they are only a few lines long. They really helped establish the book’s pace – which is rocket-like. One thing you’ll notice reading the book, though, is the lack of quote marks. Instead, Huston uses dashes at the beginning of a line to indicate someone’s speaking. There are no dialogue tags either. It was something I thought would bother me when I first started reading, but a page or two into it I was fine without the quotes. I did get me wondering, though, what others thought about this kind of rule bending. How much are you willing to put up with something like creative punctuation in a novel? Does it bother you when an author breaks the rules? Back in December when I was still unemployed I had a friend I used to work with ask me to speak to her creative writing class. I’ve never been a great public speaker, but something that I read at the time suggested that if you want to be a successful author you need to be comfortable in front of people. So, I went. It went fine. The class was nice. They paid attention, well, most of them. At the end there was a time for questions. Right away, one of the people in the class – I think it was one of the campus’ librarians – asked what kind of writer I was. I gave some rambling answer about genre and how all my stories seem to have some kind of crime involved somewhere, whether it’s big or small. I was happy with the answer and moved on. I answered a few more questions when a kid in the front asked me “Why do you write about crime?” Great follow-up, and it gave me an idea for a series of blogs. When I was in school – well, when most of us were in school – I learned about the 5 Ws and an H. The questions words. Who. What. Where. When. Why. How. Maybe it was something I should do. Maybe it was something that could be useful. So that’s what I’m doing. For the next few Mondays I’ll be taking a hard look at those questions and try to answer them. Hope you enjoy it. Hope I get something out of it.